Q: What is the origin of the pen ceremony? A movie with a difference - It's realistic. I went along to the movies not really wanting to see this movie, thinking it was a 'girly' movie, one which had more technical skill rather than a storyline. I was surprised more than anything I could imagine. I have seen a lot of movies in my time, but this movie just took me by storm. Its uniqueness, ironically enough because it was based on a real life situation was a refreshing change from the usual Hollywood blockbuster. This movie provided a brilliant (pardon the pun) insight into many aspects of a genius at work. This movie touched me on many levels. The psychology of the movie was intriguing, the mathematical philosophies was actually realistic from my own experience, and the icing on the cake making the movie stand out was surprisingly the humanistic side of Love. While love is a common basis in most movies, the interaction of this theme with other aspects of the plot was planned phenomenlly. As for the cast, I have never noticed the actual difference in skill between many actors/actresses before. I like Mel Gibson, Tom Cruise etc, but I wouldn't be able to pinpoint a classic actor's performance. 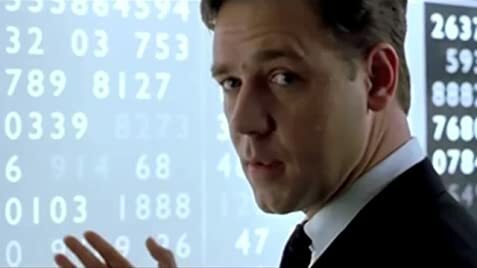 But Russell Crowe in this film showed me what it was like to act in a way where I was in awe of his skill in playing this character, especially when considering the extreme difference from characters in his other movies such as the Gladiator and The Insider. Russell Crowe was one of the big reasons this movie was so brilliant. Added to that the stellar performances of Jennifer Connelly, Ed Harris and Adam Goldberg, and this made for the 'perfect' movie. 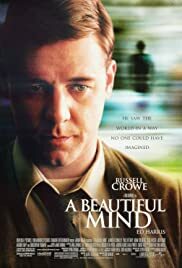 A Beautiful Mind was by far the most original, intelligent and entertaining movie I have ever seen. And this from a movie I didn't expect big things from. Kudos to Ron Howard, the cast and the crew of this movie. It was truly worthy of the Oscar, and Russell Crowe was definately the most deserving of this production team to miss out on the highest accolade. Perhaps politics played a bigger part than I previously would have thought. 277 of 365 people found this review helpful. Was this review helpful to you?